Some berries turn sweeter when the frost has had a slight bite at them. Dewberries are one of them. Suitable habitats are calcareous soils and the damper parts of the lime stone rich fields of Läänemaa; on stone walls it is even an irritating weed. The dewberry plant grow well in good light conditions; its stems lie along the ground and on the leaf stalks and plant stems are sharp spines. Under a forest canopy the dewberry grows as a bush and there are much fewer stinging spines – so much depends on the habitat. The dewberry fruit is an aggregate of drupes like the raspberry. From the fruits, black when mature and with a bluish wax layer, delicious marmalades and jams can be prepared at home. The similar blackberry grows in South and East Estonia and there they can grow together with dewberries. 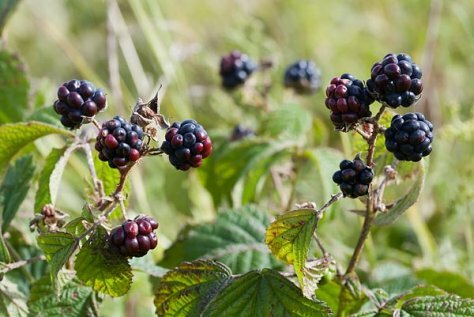 It still takes some time until blackberries are ripe for picking.